Xperia Z Ultra : 6.4 inches LCD Screen with a resolution of 1080 x 1920 pixels which gives you a pixel density of ~344 pixels per inch. It comes with shatter proof and scratch-resistant glass and Sony's own Triluminos display technology. Samsung Galaxy Mega 6.3 : 6.3 inches SC-LCD screen with a resolution of 720 x 1280 pixels which gives you a pixel density of ~233 pixels per inch. The Mega comes with TouchWiz UI. Huawei Ascend Mate : 6.1 inches IPS+ LCD with a resolution of	720 x 1280 pixels which gives you pixel density of ~241 pixels per inch. The Mate comes with Emotion UI. Xperia Z Ultra : 179.4 x 92.2 x 6.5 mm or 7.06 x 3.63 x 0.26 inches with weight at 212 g or 7.48 oz. Samsung Galaxy Mega 6.3 : 167.6 x 88 x 8 mm or 6.60 x 3.46 x 0.31 inches with weight at 199 g or 7.02 oz. Huawei Ascend Mate : 163.5 x 85.7 x 9.9 mm or 6.44 x 3.37 x 0.39 inches with weight at 198 g or 6.98 oz. In all camera and video aspects I think Sony Xperia Z Ultra is the winner in this category. It not only gives 1080p output from both cameras but even has a front camera at 2MP @ 1080p which is superior then the other two. Xperia Z Ultra : The Z Ultra runs on Quad-core 2.2 GHz, Qualcomm (MSM8274 or MSM8974 depending on the country) Snapdragon 800 processor with a Kraid 400 CPU and Adreno 330 GPU. Samsung Galaxy Mega 6.3 : Mega 6.3 runs on a Dual-core 1.7 GHz Qualcomm Snapdragon 400 with a Adreno 305 GPU. 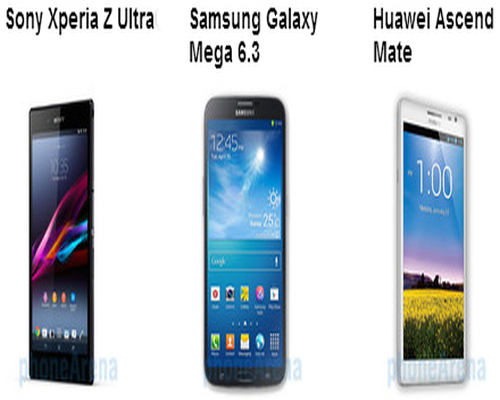 Huawei Ascend Mate : The Ascend Mate runs on a Quad-core 1.5 GHz Huawei K3V2 processor. Yet another round to Xperia Z Ultra with its very superior specs to both the other two. Xperia Z Ultra : It runs on 2GB RAM with 16GB internal memory and expansion slot for microSD with support upto 64GB. Samsung Galaxy Mega 6.3 : It runs on a 1.5GB RAM with 8/16GB internal memory and expansion slot for microSD with support upto 64GB. Huawei Ascend Mate : It has a 2GB RAM supports expansion via microSD card upto 32GB. 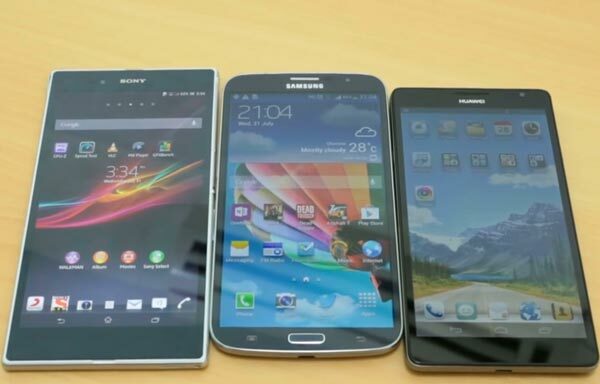 The RAM wars again belong to Sony Xperia Z Ultra. It is interesting to note that Huawei Ascend Mate is a distant 3rd in almost all the specs with Samsung Galaxy Mega 6.3 taking the first place only in the OS Wars. But then again, this lead is very fickle as all these phones should be upgraded to Android 4.3 Jelly Bean soon enough. (Kindly note that I have taken the prices from only one website so I can make a better comparision. You may get the Phablets at a cheaper/costlier price depending on your location. Considering all the specs and the prices, I would go for Sony Xperia Z Ultra. I have not taken the software and individual phone features into account. My only surprise when I did this article was the strategy of Huawei to price Ascend Mate at $950.00. As we have already seen that the Huawei's phablet lacks in almost every department except the price. Do check out the videos before deciding to buy any one of them. Also please remember the photographs are published here courtesy of phonesreview.co.uk.